Poor-quality forages make great biomass. Wisconsin farmers have been growing biomass for generations, says Kevin Shinners. They just have a different name for it. "Biomass is really just poor-quality forage," says the UW-Madison agricultural engineer. "We allow it to get very mature and it's really high in fiber, so it doesn't make very good animal feed, but it makes great biomass." And Wisconsin farmers have a leg up in the business of producing biomass, says Shinners, a specialist in forage systems who branched out into bioenergy crops about 10 years ago. VALUABLE RESOURCE: Biological systems engineering professor Kevin Shinners with the biomass known as corn stover. "We have all of the tools to harvest and handle and process it. And an added advantage is that when we take biomass off the field, we have new places to put our dairy manure," he says. "When you take corn stover off the field, you're removing nutrients that you need for next year's crop. A Wisconsin farmer can apply manure, while an Illinois farmer may have to go out and buy fertilizer." Wisconsin also is rich in off-farm resources. The state's custom harvesters are expert at chopping stalks and grass, and biomass could fit nicely into their schedule. After they finish chopping corn silage in September, crews could move on to corn stover or switchgrass in October and November, spreading fixed costs over more acres and keeping employees working longer. In fact, under some business models, farmers might job out most of their biomass crop production. If the crop is a perennial, such as switchgrass, the farmer may spend more time in front of the computer and on the phone than out in the field. "Once the crop is established, he'll manage fertilization and weed control through an agronomic service, cutting and removal through a custom harvester and marketing through a biomass aggregator," Shinners says. But even though Wisconsin farmers may be very much at home with the types of crops involved and the mechanics of producing them, they'll be on less familiar ground when it comes to marketing, Shinners notes. "If you're a cash crop farmer, you're used to marketing your corn and beans through multiple paths, selling some out of the field, storing some, selling futures, to optimize what you earn on an annual basis,"
he says. "For biomass, you'll have to change your mindset. "If a firm builds a large cellulosic biorefinery here, it will need an absolute dedicated supply," Shinners says. "If half the people in the area decided not to produce biomass one year, that plant would be a dinosaur." Meaning that a critical mass of local farmers must be willing to lock into a long-term production contract. The economics of biomass are driven by the fact that, pound for pound, the stuff isn't worth as much as other crops. Profit margins may be slim, so farmers will need to produce as efficiently as possible. That's where Shinners comes in. His research centers on streamlining the harvest and handling a variety of biomass crops, including such perennials as switchgrass and reed canarygrass, and annuals such as sorghum. 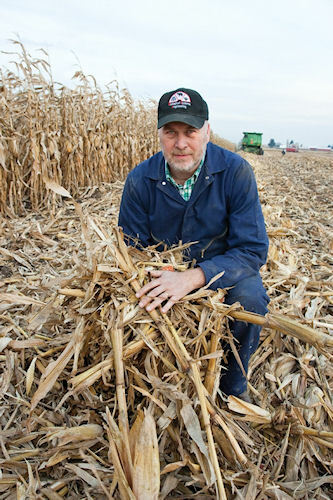 But his biggest push has been in corn stover—the stalks and leaves and cobs left after grain harvest—simply because there's so much of it. "There are some 90 million acres of corn being grown in the United States this year, and with the prices we're seeing, there's going to be more and more of it grown. If you're really interested in biomass, it's right there at our doorstep," he reasons. Since profit-minded crop producers aim to make as few trips across the field as possible, Shinners' first efforts focused on harvesting both corn grain and corn stover in one pass. Essentially, he grafted a forage harvester to the back of a combine and hitched a wagon behind to catch the chopped stover. This impressive 50-foot train of machinery worked, he says, but handling two crops at the same time slowed down the grain harvest, putting both yield and quality at risk. "That's even more of an issue these days, when we have seen corn go over $7 per bushel," he says. "As corn grain increases in value, everything that slows the combine down has a much greater economic cost." Shinners is focusing now on a system in which the combine harvests grain and leaves the stover behind in a long, neat row. "A custom harvester could come in behind and chop these windrows and store them for the farmer." Since buyers will need year-round deliveries, storing biomass crop until it's needed is part of the equation. Shinners thinks the best approach is one that dairy farmers use for forage—seal it from the air in long plastic bags or covered bunkers and let it ferment. "We know this from dairying: You can open up a silo bag from two years ago and it's still good quality," he says. That fermented biomass could be good enough to eat—by livestock, at least—which may offer farmers a way to take advantage of the bioenergy market without having to wait for a biomass refinery to be built nearby. "If we apply amendments like lime right before we store corn stover, the feed value can increase substantially," says Shinners. "So instead of waiting for somebody to develop a biorefinery in Wisconsin to convert stover to ethanol, why not divert some of the grain normally used to feed cattle toward ethanol production and use the stover to replace the corn as animal feed?"